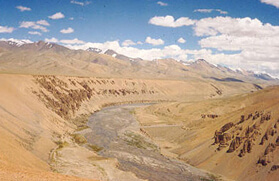 The Indus Valley is often dubbed as the soul of Ladakh. The existence of the spectacular natural vista, steep valleys and natural gallery of Neolithic relics simply justifies it. But, to explore all these attractions in one stretch, the niche path to be familiarized with them is through the Indus Valley Trek. 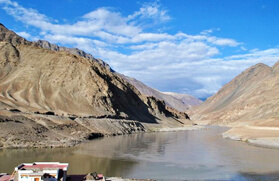 The journey includes parts of the Leh district, Skardu region and vast barren desert and beyond covering approximately 40 kilometers in 7 to 8 days commencing from Likir, which is approximately 8 to 9 kilometers drive away from Leh. 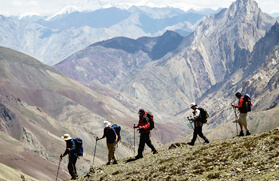 The average elevation of the Indus Valley Trek is 3,600 meters. 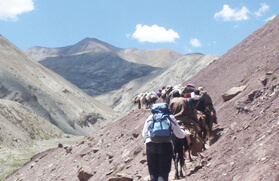 A memorable trek for the trekkers that pace along the valley and the nearby ranges, the Indus Valley Trek, which is one of the easiest treks in the Ladakh region, provides excitements for the beginners too. 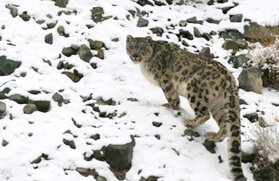 The region encircle other countries like Pakistan, Afghanistan, China and India and is secluded within the Karakoram range to the west that hosts several snowy peaks and the Zanskar range, which is a home to several endangered mountain species. 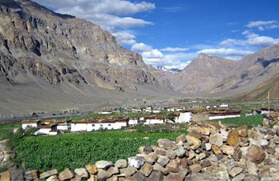 Hence one can discover the topographical changes where one side will be covered with snow clad horizon, the other will be finding with ardent greeneries, till then you come across the rocky and barren terrain too at any other directions. 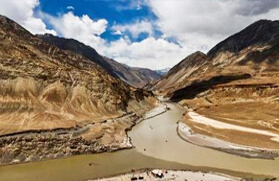 Indus Valley is geographically the most essential part of the Ladakh region as the region is gifted with the main channels of the Indus River. 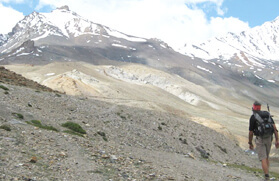 Further, trekking along the Indus Valley one will get acquainted with some of the most charming villages of Sham region and will also climb up the undulating terrain cutting through high mountain passes like Phobe La at 3700 meters and Charatse La at 3800 meters. Moreover the silk routes along the hills of Likir and Temisgang, ancient Gompas like Likir, Temisgang, Thiksey and Alchi are some other major attractions on the Indus Valley Trek. 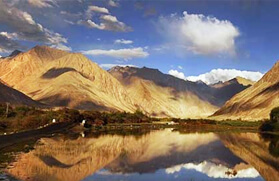 Being one of the notable treks in the Ladakh region, the Indus Valley Trek is filled with thrills and attractions that can be enjoyed during the peak seasons of Mid-June to October. On the other hand, the Indus Valley region provides a good opportunity for river rafting, mountain biking and other adventure activities. Tour of Basgo, Alchi, and Likir Gompas. Camp at Likir. Trek over Pobe la (3,550 meters) to Yangthang. O/N in camp. 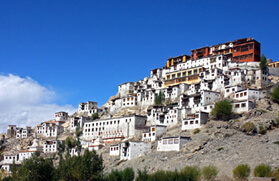 Trek to Ridzong Gompa and back to Yangthang. O/N in camp. 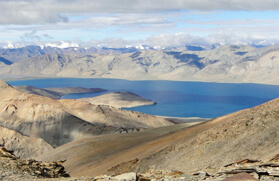 Trek over Sermanchan la (3,750 meters) and Lago la (3,750 meters) to Ang. Trek to Temisgang, then over Bongbong la (3,630 meters) to Khaltse, then by jeep to Wanla. Camp at Wanla. Trek from Wanla over Prinkti la (3,725 meters) to Lamayuru. 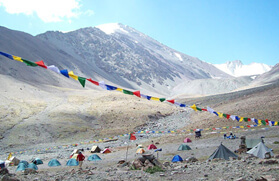 Camp at Lamayuru. Return by jeep to Leh. O/N in guest house. 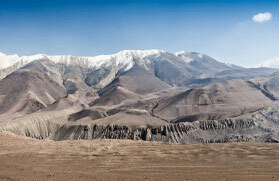 Transfer to the airport for the spectacular flight across the main chain of the Himalaya to Delhi. On arrival transfer to hotel. Overnight stay at the hotel. Departure - Delhi and transfer to airport for catching a flight to onward journey.